Jerry wonders which past athletes could hold their own in their respective sports today. There is a decided tendency for sports fans and media alike to assume that whoever the outstanding athletes are at the current time in a given sport, that they must surely be the greatest ever. That no one who came before could possibly measure up, and there could never be another as wonderful once they’re gone. I can understand why people feel that way, what with the advancements in training, nutrition, and pharmaceuticals, it’s very easy to accept that as fact. However, unless you have inside information on the end of the world, believe me, there will be another ‘greatest’ coming around soon enough. While I’m at it, don’t be so quick to dismiss all the ‘greatest’ that went before. I happen to think that there were more then a few of them who could hold their own in the present, and I’m prepared to name a few. The most obvious starting point is clearly with the self-proclaimed “Greatest” himself, Muhammad Ali. I realize that this might not being saying all that much, given how the fight game in general, and the heavyweight division in particular has fallen off. 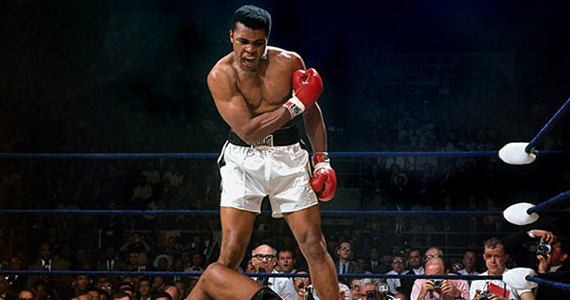 But the 6’3″, 186 to 236 pound Ali had the speed and power to float and sting his way through any decade. Although he stayed too long in the business, (1960 to 1981) his 56-5 record (37KO’s) is still impressive. 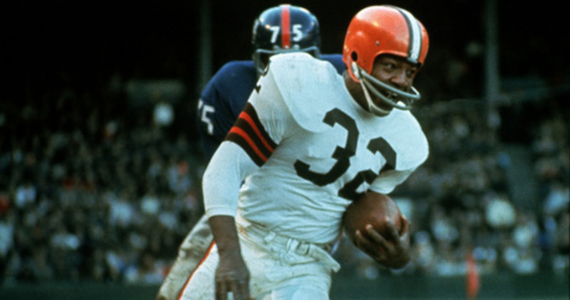 While on the topic of obvious choices, my next performer is my personal selection for the title of “Greatest Athlete Who Ever Lived”, Jim Brown (’57-’65). The 6’2″, 232 pound Brown is rumored to have once run a 4.12 ’40’. (The current record is 4.24, run by Chris Johnson back in ’08.) Although Brown’s time is likely a bit suspect, he clearly possessed the speed and power to be a force in the modern game. Other football players who came into the game in the 60’s who I feel could be stars today include Gale Sayers (’65-’71) and John Mackey. The 6′, 200 pound Sayers, aka the “Kansas Comet”, had his career as a running back for the Bears cut short by knee injuries that likely could have been more effectively treated with today’s methods, thereby extending his career. As it was, he only had four complete seasons in the seven that he was in the league, but still amassed almost 5000 yards at a 5 yards per carry pace, and a total of 9,435 all-purpose yards. He possessed that kind of elusive speed and strength that easily could have won for him a large contract, if nothing else. Mackey (’63-’72) was a 6’2″, 224 pound tight end for the Baltimore Colts, and one of the first at that position who was equally adept at running over as well as away from would be tacklers. I believe in today’s game he would likely be utilized effectively out of the backfield. Jim Brown could definitely hold his own against the best NFL defenses today. I also think that the 5’11”, 180 pound Willie Mays would have made a great defensive back (if Assaunte Samuels is worth $12 million, what would Willie make?) Actually, in this day when so many of the outstanding African-American athletes are forsaking baseball for other sports, we truly need another Willie Mays, to breath life back into the game. A game I’m sure he could dominate once again. 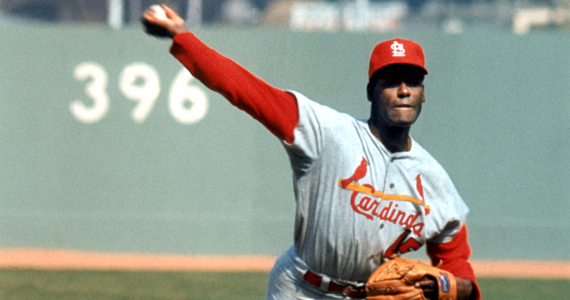 Speaking of both African-Americans and dominating; Cardinals great Bob Gibson, a 6’1″, 190 pounder, who had 251 wins (255 complete games) in his 17 year career, could master this decade just as he did the ’60’s. I’ve written enough about Red Sox great Ted Williams in the past, to just add that his legendary eyesight and eye-hand coordination would make him a superstar in any era. As would the elegant power of the Braves Henry Aaron. The 6′, 180 pound Aaron was the very picture of durability and consistency, playing in almost 3,300 games in his 23 year career. Although the modern game seems to grind people down, I see in him as the Derek Jeter type of player, who just keeps rolling along. Gibson’s fastball could probably get out any big league hitter today as well. For now anyway, my last two athletes who I feel could compete quite well in their modern games are Bobby Orr of the Boston Bruins, and golf’s Arnold Palmer. In Orr’s case, just imagine Mickey Mantle on skates. The 6′, 200 pound defenseman was a combination of speed and strength that had to be witnessed in person to be truly appreciated. He was absolutely fearless, and quick to drop the gloves, with 47 fighting majors in 657 career games. (About twice as many as Gordie Howe in about half the games.) I think he would do alright in today’s game. As would the 5’10”, 185 pound Palmer. If you google him, you’ll likely find pictures of him in his prime that show that he had shoulders and arms to rival that of Tiger Woods. Palmer is credited by many, including Jack Nicklaus, as having made golf attractive for television back in the 60’s; as Tiger has done for the game of today. Could you imagine the ratings if they were competing at the same time? Something to think about…. Of these athletes, only Gehrig performed before I was born, all the rest I was able to either see in person or follow through the media of the day. I know I left out a great many performers from the past, and didn’t even begin to talk about the careers of the great female athletes I’ve been privileged to watch. I’ve also noticed there’s a bit of a Northeast bias to my thinking, for which I have no explanation, except that I been watching sports since before jet travel. I suppose the natural extension from this is to wonder who performing today will still be talked about three, four, five decades from now. Any guesses? Anyone?